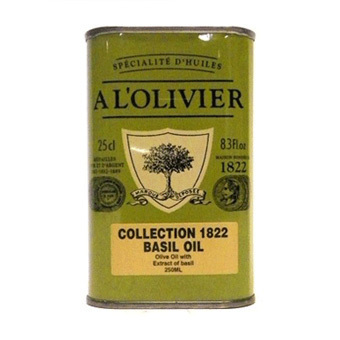 France's most respected oil specialist, A L´Olivier, has fashioned a selection of flavorful herb infused oils that are destined to become a staple in your pantry! Made with A L'Olivier top-quality extra virgin olive oil, this aromatic basil oil stands out by virtue of its unmistakable flavor of fresh picked, sweet basil. This remarkable oil can be used in all preparations enhanced by the aroma and taste of fresh basil. Enjoy drizzled over a plate of fresh tomatoes and mozzarella, a bowl of steaming pasta, or in your favorite homemade pasta sauce! The story of A L'Olivier began in 1822 in the Marais district in the heart of Paris. Mr. Popelin, a pharmacist at the time, decided to set up a stall devoted to olive oil. This pioneering man of vision was already aware in 1822 of modern press claims that are bolstered by extensive scientific studies: The Green Gold is an elixir. For years he vaunted the merits of olive oil to Parisians and in time the firm became the haunt of lovers of the Mediterranean art of living. Today, A L'Olivier remains France's most respected producer of specialty oils and vinegars.